I collected my new glasses yesterday - which was an incredibly speedy service by the optician. I 'quite' like them when they're on, not that I ever really 'like' any glasses I've ever had, and I've been wearing glasses pretty much constantly since I was five years old!! They're really light, and seem to fit well (something of a miracle as I have an incredibly large head! ), and are the 'trendy' squared-off shape which pretty much all glasses seem to be these days. The best thing is they're made of anti-allergy metal which, fingers' crossed, will mean I no longer have a sore spot behind one ear where the arm of my glasses sit. I had my old glasses for 10 years or so and despite taping the ends with sellotape a la Jack Duckworth, I've had a constantly weepy sore spot behind just one ear from an allergy to the nickel. Luckily, I only need to wear glasses for watching telly, the cinema, theatre etc, and for driving. At the moment my new specs are pristinely clean, and being kept lovingly in their case when not perched on my nose. For sure that level of care won't last long, but for now it is a joy to be able to see a bit clearer and through clean lenses to boot. After a busy afternoon hunched over the sewing machine, I actually did get all three pillowcase book bags sewn up and finished. They all turned out quite well, and I'm feeling smugly satisfied that I actually got my act together and sewed them up - instead of procrastinating for weeks which is what usually happens! 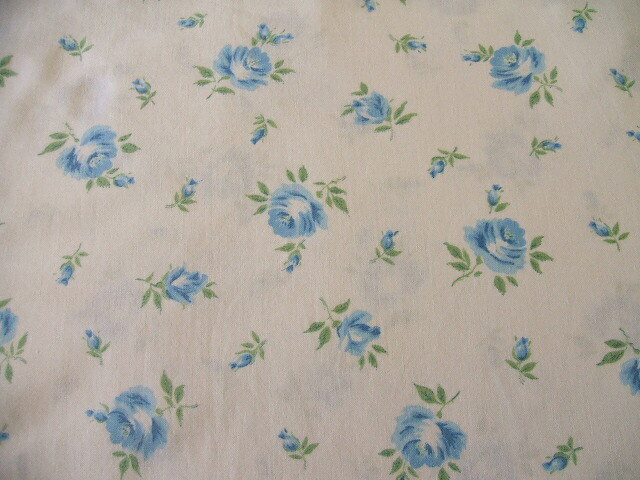 I've found a few nice vintage pillowcases recently (or pillercases if you'm speakin' Bristle). I love some of the patterns you get on old pillowcases and the ones I've found were not so precious that I felt bad about cutting them up to make book bags with. I found this one last week in a charity shop in Bristol. It's pure cotton and those lovely fresh roses on a white background somehow remind me of summer nightdresses when I was little and sun-dried washing blowing on the line. If it hadn't have been in such a pickle - someone had really cobbled the side seams together at some point - I would have even been tempted to use this one as a pillowcase. 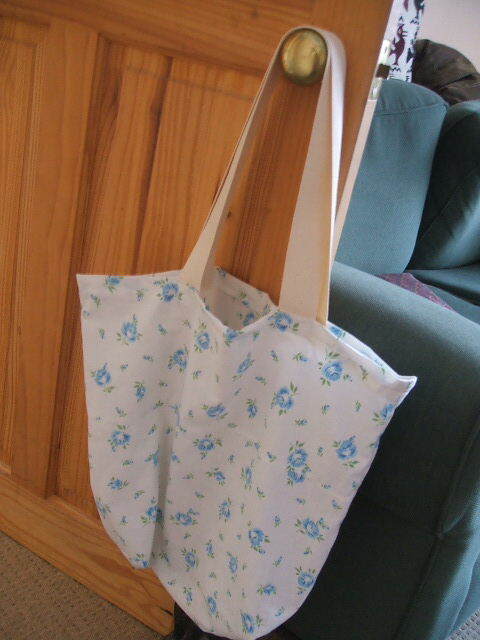 As it is I'm hoping it will make a nice book bag. 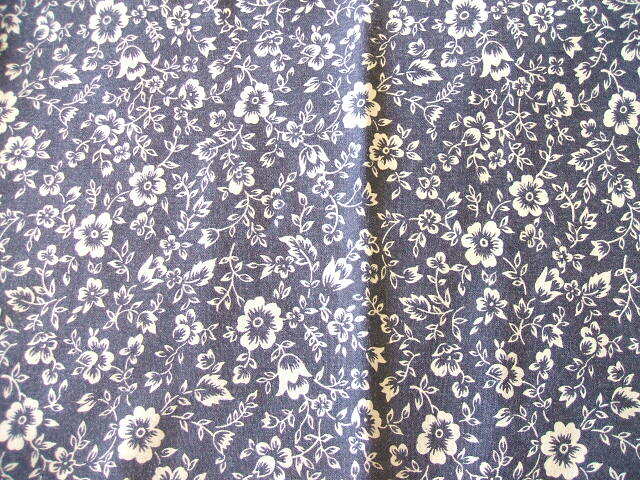 This is another one I picked up in a charity shop on a previous visit to Bristol. There is something very vintage Laura Ashley about those tiny white flowers on a dark blue background, and it reminds me of tiny cottage bedrooms with a jug and bowl set on a pine chest of drawers. 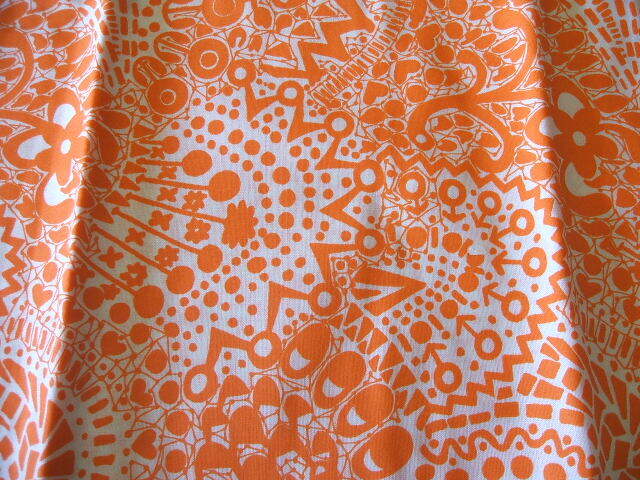 This incredibly 'busy' orange and white one is the second of an unused pair I found in a charity shop in Billericay. I'm not sure I would want to sleep with a pattern which is quite so migraine inducing, but it certainly makes a very vibrant book bag. 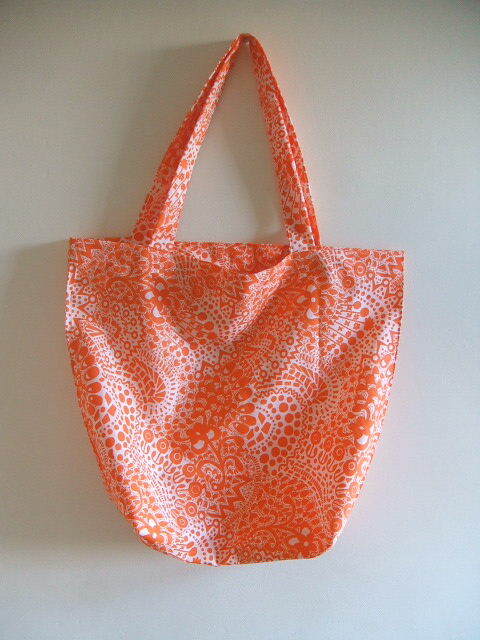 Somehow the orange and white reminds me of a certain type of sweet wrapper when I was little, I think they were called Spangles. After spending quite a pleasant hour with a hot iron, a tape measure, and a piece of dressmaker's chalk, these are now all cut up and ready for me to get the sewing maching out. I'm hoping I might manage to sew them all up over the weekend - finger's crossed!! A bit of a boring post today I'm afraid. For a start, there's no photo as my computer downstairs is still refusing to acknowledge the broadband connection exisits so I'm having to use P's computer in his study, for which my camera is not yet set up. P has been working from home today and has now had to take to his bed because of a very bad headache - which means I have to a) be very quiet whilst using his computer and b) I've been unable to add anything on ebay this afternoon as he needed to use the phone and my computer (where the photos for ebay are stored) needs to use ye olde dial up which means the phone line is out of commission. Are you with me so far? A few years ago P and I went for a long weekend to Oslo. The felted goods they had for sale there were just fantastic - as were the prices - and, sadly, the only thing I could sensibly afford to bring back as a souvenir was a felted keyring. The keyring was great as the large piece of felt on the end of it meant I could always find my keys in the bottom of any bag. Of course, this often meant heavy pulling on the felt part and so, eventually, the felt came away from the keyring. I did toy with the idea of trying to mend it but somehow I never got around to the job, and I'm not sure how well it would have held together anyway. For the past few months I've been keeping my eyes open for a nice replacement keyring, but I've never found one I really liked. Until Saturday that is. 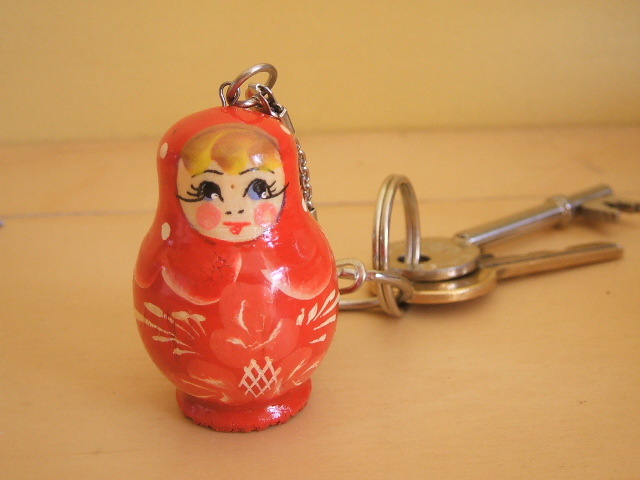 DN, Mum, my sister and I were strolling along Corn Street in Bristol (site of the Bristol Nails - origin of the saying 'cash on the nail'), having a look at the rather nice craft stalls that were there, when I spied a stall selling painted wooden Russian Matryoshka dolls - and keyrings. She's sweetly pretty and beautifully painted. DN picked out his favourite colour for me and for £1.50 I was all set up with just the sort of keyring I had been looking for. Large enough to find my keys in the bottom of my bag, and just that little bit unusual. I was well pleased!! Of course, I wish now I'd bought a few more but hey ho! perhaps the stall will be there again when I next visit Bristol. Yesterday, Mum and I took ourselves up to the Whiteladies Road area of Bristol again to have a mooch about, check out the charity shops and have some lunch in the lovely Fresh and Wild on Queens Road. I managed to find a couple of nice things in the charity shops. 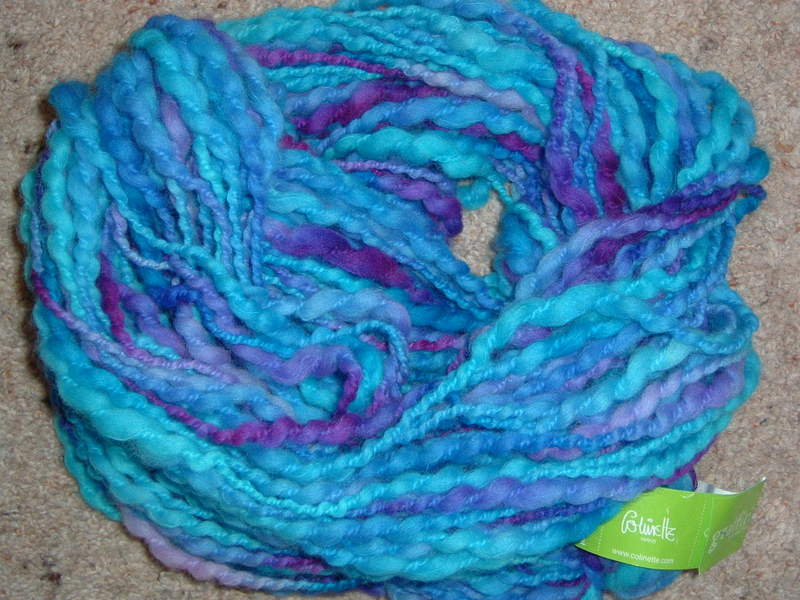 A fabulous vibrantly coloured 100g skein of Colinette Grafitti wool. I'm not sure what I'll do with this but at 99p it was definitely coming home with me. The colour is called Blue Saturn and it is the most fantastic mixture of aqua, cobalt, speedwell and sky blue mixed with flashes of deep deep purple. Delicious. 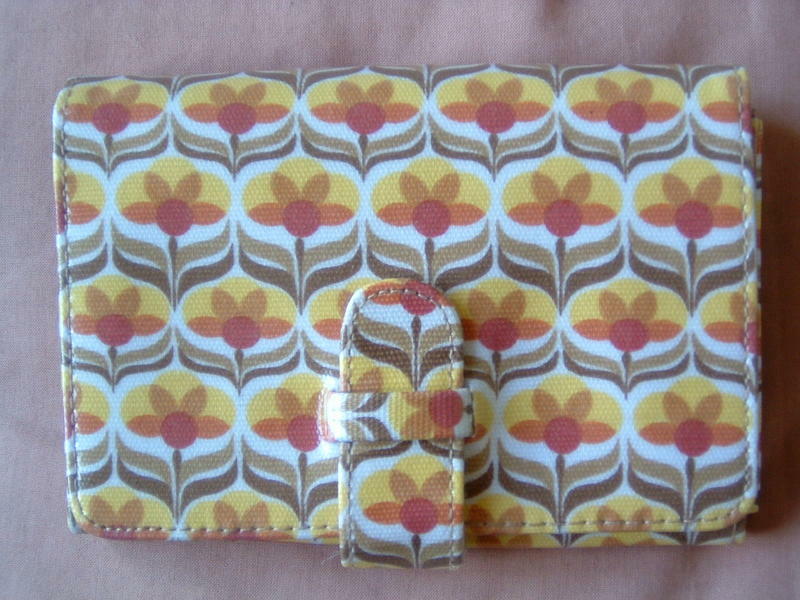 In the same charity shop I also picked up this rather nice Orla Keilly-style purse / wallet for 75p. This was rather fortuitous as my old faithful Radley purse has got a bit of a dodgy zip these days and I keep finding all my loose change cascading to the bottom of my handbag. I had toyed with the idea of having one of Cath Kidston's rather nice PVC purses for my birthday but they cost £25 so this was a much better alterantive! Speaking of Cath Kidston, Mum and I also had a look in her new shop on Park Street in Bristol. It is a lovely big shop and appears to stock her whole range of items. But, somehow, Mum and I were just a tad disappointed by it all. The felt mushrooms which I'd been quite coveting were very 'nylon-y' to the touch as was a knitted doll which was for sale at £25. The T-towels, although having lovely prints on them, were rather thin and perhaps not really up to the job of drying dishes. 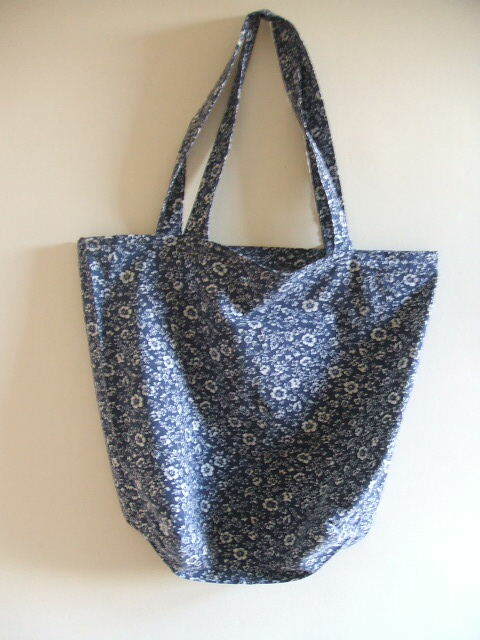 But what I found most amazing was what I assume is a new line for CK - bags made from vintage fabric (not vintage CK just ordinary vintage) which cost £36, or £25 for an unlined one which was only big enough to hold a purse and a mobile phone!! Somehow I think I'll stick to making my own!